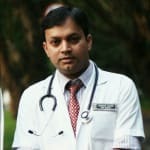 Dr. Anurag Anand is a popular General Physician in Manipal, Mangalore. He has helped numerous patients in his 5 years of experience as a General Physician. He is a qualified Kasturba Medical College, Manipal . You can consult Dr. Anurag Anand at Kasturba Hospital Manipal in Manipal, Mangalore. Book an appointment online with Dr. Anurag Anand on Lybrate.com. Find numerous General Physicians in India from the comfort of your home on Lybrate.com. You will find General Physicians with more than 37 years of experience on Lybrate.com. We will help you find the best General Physicians online in Delhi. View the profile of medical specialists and their reviews from other patients to make an informed decision. I want to loose my body weight. I want to loose my chest fat and belly fat. What kind of food I take and what kind of exercise I do? Hi ,thank you for your question. Weight can be reduced by many ways like proper diet intake, workouts etc. Among all these diet modification is most important. Try to decrease carbohydrate and fat content of your food. Take more protein containing food. Go for atleast 30 minutes aerobic exercises per day if you don't have any cardiac issues. If you need any further help, feel free to connect with me and I will be happy to assist you. I have Running noise and headache since today's morning would you please suggest any useful medicine for it. Hi, thank you for the question. Running nose snd headache can be due to many reasons like acute viral infections, acute sinusitis etc. We need more history to come to a proper diagnosis. As of now you can do water vapour inhalation thrice a day, you will feel better. Feel free to ask more about medicines etc and I will be happy to assist you. The massage of oil result in more hairloss during hair wash how should I deal with it. Hi, thank you for the question. Based on your history it looks like your hair growth is not healthy and you are having continuous hair loss problem. It's good to diagnose exact cause like fungal infection of scalp etc and it should be managed early to maintain good hair. To overcome your problem you need to have a strong hair root. Try to maintain proper scalp hygiene and take proper balanced diet. Feel free to ask me more about medicines etc and I will be happy to assist you. Dear Doctor. I am a plus two student. I am overweight. I do not have a proper diet. I want to loose my weight. Please suggest a diet for me. I am completely ok other than this. I do not have a bp problems or thyroid or anything. Please help me. I am suffering through hair fall from past 4-5 years I also see some baldness near my forehead my hair are really thin I do not know what to do what to apply or how to make my hair grow again I am just 20 years old. Hi, thank you for the question. Hair loss can be due to many reasons like scalp fungal infection, hormonal effects etc. Proper history need to be asked more to diagnose this condition especially grade of hair loss. Based on that good medicines and dietmodifications need to be advised for controlling hair fall. It is possible to get new hair especially in those are where hair follicles are present underneath. Feel free to ask me more and I will be happy to assist you. Sir mujhe chakkar aate hai pehle halke the ab jyada ho gaye road par chalne main dikkat hoti hai. Hi, thank you for the question. Giddiness can be due to many reasons like decreased blood pressure, hypoglycemia etc. First of all try to modify your lifestyle, take proper food on time, take good sleep, go for a walk every day. Proper clinical examination and history should be taken to come to a proper diagnosis. I'm having hair fall problem and it's looks like bald. My parent doesn't have any bald and only grand father having. Is it genetic problem or do we have any treatment to regrowth the hair. Hi, thank you for the question. Hair loss can be due to many reasons like scalp fungal infection, hormonal effects etc. Proper history need to be asked more to diagnose this condition. Good medicines and diet modifications are available for controlling hair fall. It is possible to get new hair especially in those are where hair follicles are present underneath. Feel free to ask me more and I will be happy to assist you. Good evening doctor. I am 47 years old lady you am working in a college as a librarian I am looking hair and facing baldness. I have done so many treatments but no use baldness us increasing what should I do to regrow the hair in bald area. Hi, thank you for the question. Hair loss can be due to many reasons like scalp fungal etc.In females hair loss occurs as central parting. Proper history need to be asked more to diagnose this condition. Good medicines and diet modifications are available for controlling hair fall. Feel free to ask me more and I will be happy to assist you. I am a 28 years old guy. I am having a right side low back pain from last 1 month. When I eat a painkiller, It gives relief for that day but again the pain start the 2nd day. Tried a visit to a normal doctor he gave couple of medicines but it didn't cure at all. Please advise. Hi, thank you for the question. Back pain can be due to several problem which include intervertbral disc bulge etc. For this condition proper medicines available which can decrease symptoms and physiotherapy is also recommended to avoid this condition to recur again. Feel free to ask me more and I will be happy to assist you. I have a job what I am doing to hair falling may hair I have no one solution so please help me what I mam doing. Hi, Thank you for the question. Hair fall can be due to many reasons like fungal infection of scalp, hereditary factors etc. You need to get evaluated properly and based on that medicines need to be prescribed. Many medicines are available for controlling hair fall. Feel free to ask me more and I will be happy to assist you.